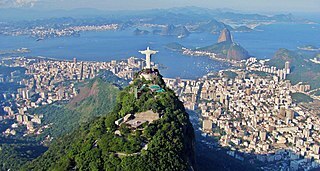 Bounded by the Atlantic Ocean on the east, Brazil has a coastline of 7,491 kilometers (4,655 mi). 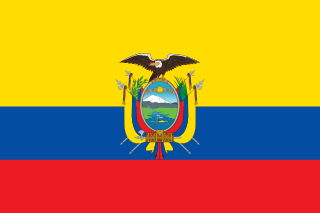 It borders all other South American countries except Ecuador and Chile and covers 47.3% of the continent's land area. Its Amazon River basin includes a vast tropical forest, home to diverse wildlife, a variety of ecological systems, and extensive natural resources spanning numerous protected habitats. This unique environmental heritage makes Brazil one of 17 megadiverse countries, and is the subject of significant global interest and debate regarding deforestation and environmental protection. The coastline of Brazil measures 7,491 km, which makes it the 16th longest national coastline of the world. All the coast lies adjacent to geographical features can be found all through the coastal areas, like islands, reefs and bays. The beaches of Brazil are famous in the world and receive a great number of tourists. Brazil is considered an advanced emerging economy. 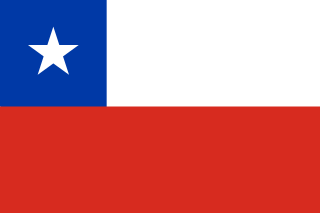 It has the ninth largest GDP in the world by nominal, and eight and PPP measures. It is one of the world's major breadbaskets, being the largest producer of coffee for the last 150 years. 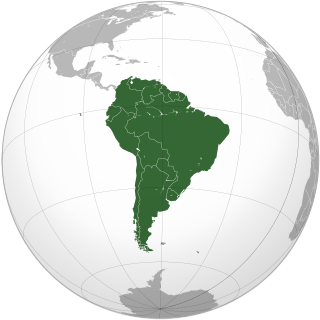 It is classified as an upper-middle income economy by the World Bank  and a newly industrialized country,   with the largest share of global wealth in Latin America. Brazil is a regional power and sometimes considered a great    or a middle power in international affairs. 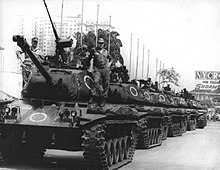 On account of its international recognition and influence, the country is subsequently classified as an emerging power  and a potential superpower by several analysts. 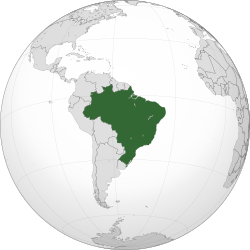 Brazil is a founding member of the United Nations, the G20, BRICS, Union of South American Nations, Mercosul, Organization of American States, Organization of Ibero-American States and the Community of Portuguese Language Countries. 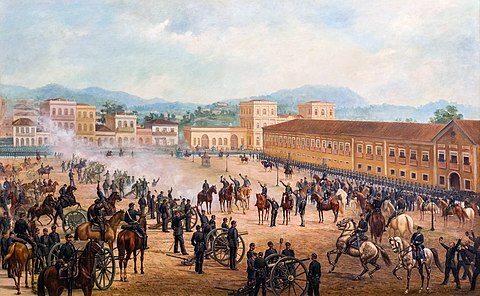 Proclamation of the Republic , 1893, oil on canvas by Benedito Calixto. Larger mammals include carnivores pumas, jaguars, ocelots, rare bush dogs, and foxes, and herbivores peccaries, tapirs, anteaters, sloths, opossums, and armadillos. Deer are plentiful in the south, and many species of New World monkeys are found in the northern rain forests. Concern for the environment has grown in response to global interest in environmental issues. Brazil's Amazon Basin is home to an extremely diverse array of fish species, including the red-bellied piranha. Despite its reputation as a ferocious freshwater fish, the red-bellied piranha is actually a generally timid scavenger. 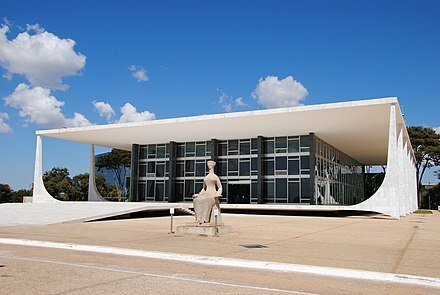 The political-administrative organization of the Federative Republic of Brazil comprises the Union, the states, the Federal District, and the municipalities. The Union, the states, the Federal District, and the municipalities, are the "spheres of government". The federation is set on five fundamental principles:  sovereignty, citizenship, dignity of human beings, the social values of labour and freedom of enterprise, and political pluralism. The classic tripartite branches of government (executive, legislative and judicial under a checks and balances system) are formally established by the Constitution. The executive and legislative are organized independently in all three spheres of government, while the judiciary is organized only at the federal and state and Federal District spheres. Together with several smaller parties, four political parties stand out: Workers' Party (PT), Brazilian Social Democracy Party (PSDB), Brazilian Democratic Movement (MDB) and Democrats (DEM). Fifteen political parties are represented in Congress. It is common for politicians to switch parties, and thus the proportion of congressional seats held by particular parties changes regularly. Almost all governmental and administrative functions are exercised by authorities and agencies affiliated to the Executive. Brazilian law is based on the civil law legal system  and civil law concepts prevail over common law practice. Most of Brazilian law is codified, although non-codified statutes also represent a substantial part, playing a complementary role. Court decisions set out interpretive guidelines; however, they are seldom binding on other specific cases. Doctrinal works and the works of academic jurists have strong influence in law creation and in law cases. The legal system is based on the Federal Constitution, promulgated on 5 October 1988, and is the fundamental law of Brazil. All other legislation and court decisions must conform to its rules. As of April 2007 [update] , there have been 53 amendments. States have their own constitutions, which must not contradict the Federal Constitution. Municipalities and the Federal District have "organic laws" (leis orgânicas), which act in a similar way to constitutions. Legislative entities are the main source of statutes, although in certain matters judiciary and executive bodies may enact legal norms. Jurisdiction is administered by the judiciary entities, although in rare situations the Federal Constitution allows the Federal Senate to pass on legal judgments. There are also specialized military, labor, and electoral courts. The highest court is the Supreme Federal Court. Municipalities, as the states, have autonomous administrations, collect their own taxes and receive a share of taxes collected by the Union and state government. Each has a mayor and an elected legislative body, but no separate Court of Law. Indeed, a Court of Law organized by the state can encompass many municipalities in a single justice administrative division called comarca (county). 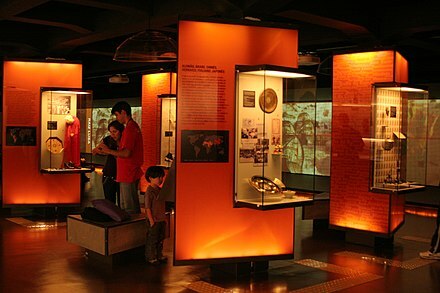 The industry – from automobiles, steel and petrochemicals to computers, aircraft and consumer durables – accounted for 30.8% of the gross domestic product. Industry is highly concentrated in metropolitan São Paulo, Rio de Janeiro, Campinas, Porto Alegre, and Belo Horizonte. Brazil has become the fourth largest car market in the world. Major export products include aircraft, electrical equipment, automobiles, ethanol, textiles, footwear, iron ore, steel, coffee, orange juice, soybeans and corned beef. In total, Brazil ranks 23rd worldwide in value of exports. Between 1993 and 2010, 7012 mergers & acquisitions with a total known value of $707 billion with the involvement of Brazilian firms have been announced. The year 2010 was a new record in terms of value with US$115 billion of transactions. The largest transaction with involvement of Brazilian companies has been: Cia. Vale do Rio Doce acquired Inco in a tender offer valued at US$18.9 billion. Domestic tourism is a fundamental market segment for the industry, as 51 million people traveled throughout the country in 2005,  and direct revenues from Brazilian tourists reached US$22 billion,  5.6 times more receipts than international tourists in 2005. 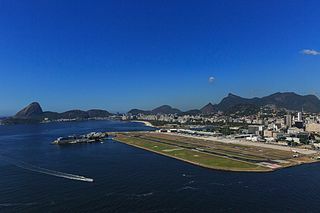 In 2005, Rio de Janeiro, Foz do Iguaçu, São Paulo, Florianópolis and Salvador were the most visited cities by international tourists for leisure trips. The most popular destinations for business trips were São Paulo, Rio de Janeiro and Porto Alegre. In 2006 Rio de Janeiro and Fortaleza were the most popular destinations for business trips. Brazil's railway system has been declining since 1945, when emphasis shifted to highway construction. The total length of railway track was 30,875 km (19,185 mi) in 2002, as compared with 31,848 km (19,789 mi) in 1970. Most of the railway system belonged to the Federal Railroad Corporation RFFSA, which was privatized in 2007. The São Paulo Metro was the first underground transit system in Brazil. The other metro systems are in Rio de Janeiro, Porto Alegre, Recife, Belo Horizonte, Brasília, Teresina and Fortaleza. The country has an extensive rail network of 28,538 kilometres (17,733 miles) in length, the tenth largest network in the world. Currently, the Brazilian government, unlike the past, seeks to encourage this mode of transport; an example of this incentive is the project of the Rio–São Paulo high-speed rail, that will connect the two main cities of the country to carry passengers. The population of Brazil, as recorded by the 2008 PNAD, was approximately 190 million  (22.31 inhabitants per square kilometre or 57.8/sq mi), with a ratio of men to women of 0.95:1  and 83.75% of the population defined as urban. 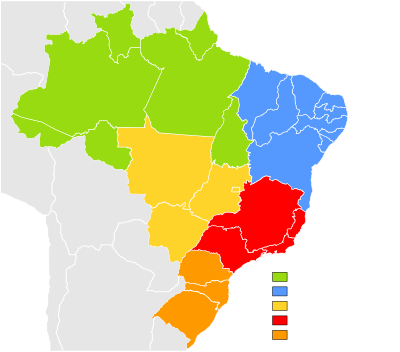 The population is heavily concentrated in the Southeastern (79.8 million inhabitants) and Northeastern (53.5 million inhabitants) regions, while the two most extensive regions, the Center-West and the North, which together make up 64.12% of the Brazilian territory, have a total of only 29.1 million inhabitants. The architecture of Brazil is influenced by Europe, especially Portugal. 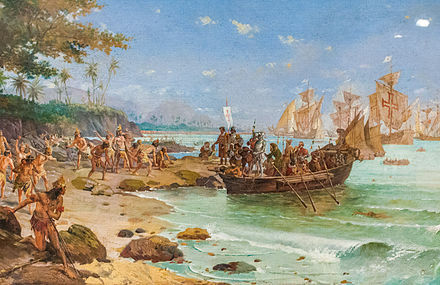 It has a history that goes back 500 years to the time when Pedro Cabral discovered Brazil in 1500. Portuguese colonial architecture was the first wave of architecture to go to Brazil. It is the basis for all Brazilian architecture of later centuries. 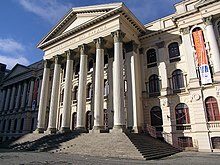 In the 19th century during the time of the Empire of Brazil, Brazil followed European trends and adopted Neoclassical and Gothic Revival architecture. 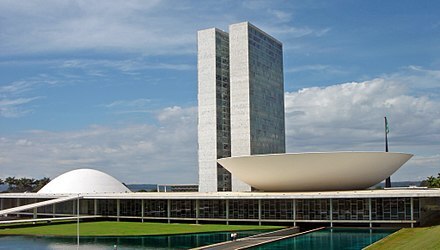 Then in the 20th century especially in Brasilia, Brazil experimented with Modernist architecture. Tom Jobim, one of the creators of bossa nova , and Chico Buarque, one of the leading names of MPB. A typical meal consists mostly of rice and beans with beef, salad, french fries and a fried egg. Often, it's mixed with cassava flour (farofa). Fried potatoes, fried cassava, fried banana, fried meat and fried cheese are very often eaten in lunch and served in most typical restaurants. Popular snacks are pastel (a fried pastry); coxinha (a variation of chicken croquete); pão de queijo (cheese bread and cassava flour / tapioca); pamonha (corn and milk paste); esfirra (a variation of Lebanese pastry); kibbeh (from Arabic cuisine); empanada (pastry) and empada, little salt pies filled with shrimps or heart of palm. The Brazilian film industry began in the late 19th century, during the early days of the Belle Époque. While there were national film productions during the early 20th century, American films such as Rio the Magnificent were made in Rio de Janeiro to promote tourism in the city. The films Limite (1931) and Ganga Bruta (1933), the latter being produced by Adhemar Gonzaga through the prolific studio Cinédia, were poorly received at release and failed at the box office, but are acclaimed nowadays and placed among the finest Brazilian films of all time. 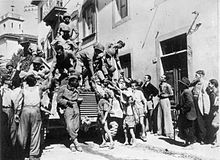 The 1941 unfinished film It's All True was divided in four segments, two of which were filmed in Brazil and directed by Orson Welles; it was originally produced as part of the United States' Good Neighbor Policy during Getúlio Vargas' Estado Novo government. During the 1990s, Brazil saw a surge of critical and commercial success with films such as O Quatrilho (Fábio Barreto, 1995), O Que É Isso, Companheiro? (Bruno Barreto, 1997) and Central do Brasil (Walter Salles, 1998), all of which were nominated for the Academy Award for Best Foreign Language Film, the latter receiving a Best Actress nomination for Fernanda Montenegro. The 2002 crime film City of God , directed by Fernando Meirelles, was critically acclaimed, scoring 90% on Rotten Tomatoes,  being placed in Roger Ebert's Best Films of the Decade list  and receiving four Academy Award nominations in 2004, including Best Director. 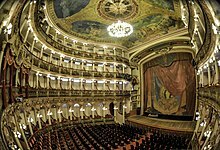 Notable film festivals in Brazil include the São Paulo and Rio de Janeiro International Film Festivals and the Gramado Festival. São Paulo/Congonhas AirportPortuguese pronunciation: [kõˈɡõɲɐs] is one of the four commercial airports serving São Paulo, Brazil. 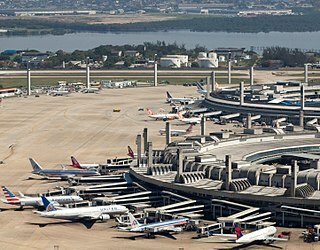 The airport is named after the neighborhood where it is located, formerly called Vila Congonhas, property of the descendants of Lucas Antônio Monteiro de Barros (1767–1851), Viscount of Congonhas do Campo, first president of the Province of São Paulo after the independence of Brazil in 1822, during the Empire. In turn, the Viscount's domain was named after the plural of a shrub known in Brazil as congonha-do-campo. White Brazilians refers to Brazilian citizens of European and Middle Eastern descent. According to the 2010 Census, they totaled 91,051,646 people and made up 47.73% of the Brazilian population. The main ancestry of White Brazilians is Portuguese, followed by Italian, Spanish, German and other German-speaking nationalities, Slavic, French, Dutch, Arab, Scandinavian and Baltic. The first two ancestries figure over 30 million people and the following two around 20 million people. While the fifth and sixth revolve around 9 million people and the last four figure over a million. The history of the Jews in Brazil is a rather long and complex one, as it stretches from the very beginning of the European settlement in the new continent. 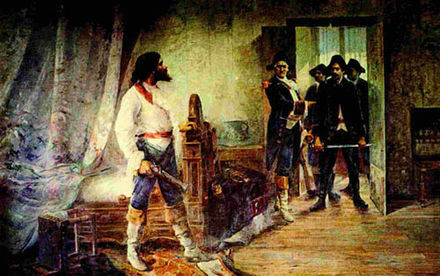 Although only baptized Christians were subject to the Inquisition, Jews started settling in Brazil when the Inquisition reached Portugal, in the 16th century. They arrived in Brazil during the period of Dutch rule, setting up in Recife the first synagogue in the Americas, the Kahal Zur Israel Synagogue, as early as 1636. Most of those Jews were Sephardic Jews who had fled the Inquisition in Spain and Portugal to the religious freedom of the Netherlands. In his The Wealth of Nations, Adam Smith attributed much of the development of Brazil's sugar industry and cultivation to the arrival of Portuguese Jews who were forced out of Portugal during the Inquisition.. Sport Club São Paulo, also known as São Paulo, are a Brazilian football team from Rio Grande, Rio Grande do Sul. They competed in the Série A three times. Empresa de Transportes Aéreos Aerovias Brasil S/A was a Brazilian airline founded in 1942. It was merged into Varig in 1961, when Varig bought the Consórcio Real-Aerovias-Nacional, of which Aerovias Brasil was one of the partners. 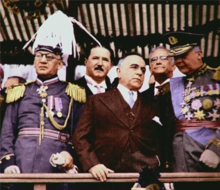 This is a timeline of Brazilian history, comprising important legal and territorial changes and political events in Brazil and its predecessor states. 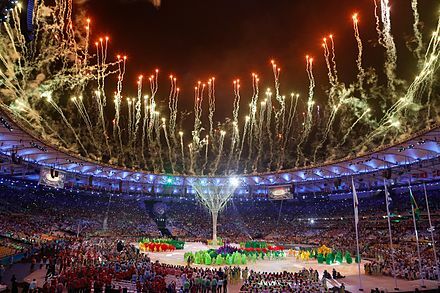 To read about the background to these events, see History of Brazil. The March of the Family with God for Liberty was a series of public demonstrations in Brazil. The first march was held in São Paulo on March 19, 1964 to coincide with St Joseph's Day — the patron saint of the family — and attracted an estimated 300,000 to 500,000 attendees. ↑ Vallance, Monique M. (2012). 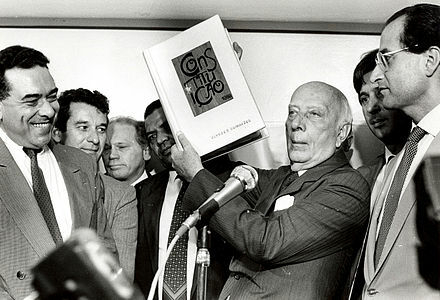 "Preface and Observations on Contemporary Brazil". 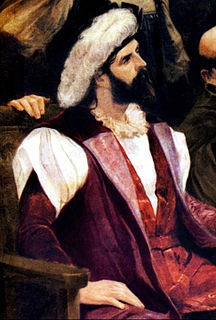 In Crocitti, John J. (ed.). Brazil Today: An Encyclopedia of Life in the Republic. Contributing editor Monique M. Vallance. ABC-CLIO. 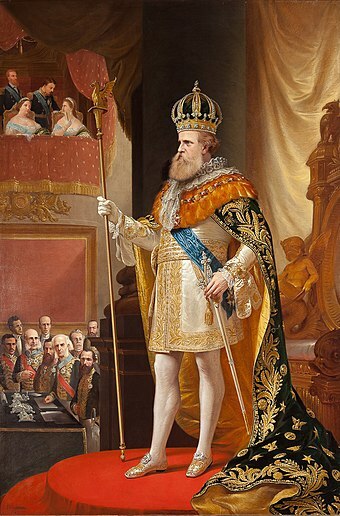 p. xxiii. ISBN 978-0-313-34672-9. OCLC 787850982. ↑ "International Monetary Fund". imf.org. ↑ Robert M. Levine; John J. Crocitti (1999). The Brazil Reader: History, Culture, Politics. Duke University Press. pp. 11–. ISBN 978-0-8223-2290-0 . Retrieved 12 December 2012. 1 2 Fausto, Carlos (2000). Zahar, Jorge (ed.). Os Índios antes do Brasil[The Indians before Brazil] (in Portuguese). pp. 45–46, 55. ISBN 978-85-7110-543-0. ↑ "Ó Gráda, C.: Famine: A Short History Archived 12 January 2016 at the Wayback Machine ." Princeton University Press. ↑ Fabiano Deffenti; Welber Oliveira Barral (2011). 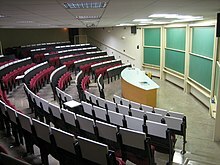 Introduction to Brazilian Law. Kluwer Law International. pp. 20–. ISBN 978-90-411-2506-4 . Retrieved 6 June 2013. ↑ "Defesanet – Brigada de operações especiais" . Retrieved 27 June 2010.